Missouri Gov. Mike Parson signs paperwork after taking his oath of office. "Public service is a privilege," he said in remarks after being sworn in at the Capitol. 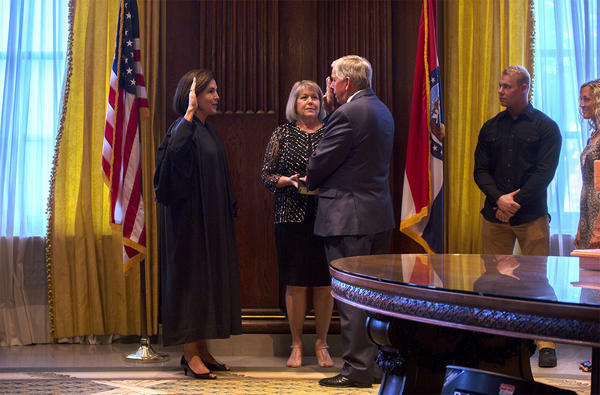 "I pledge to all Missourians to work hard each and every day to bring honor, integrity and transparency to the governor's office." And he also pledged to mend the relationships with the General Assembly, which had frayed badly under Greitens. 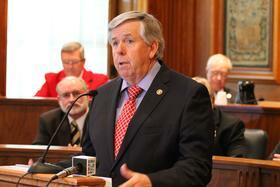 "We have an opportunity beginning today for a fresh start in state government," Parson said. "There's many, many common grounds for the state of Missouri such as infrastructure and workforce development. My purpose for being the governor will be to try to bring people together to try and move the state of Missouri forward for what's best for the state of Missouri." The swearing in of Parson marks the end of a year-and-a-half period where a candidate with no prior political experience took charge. At least until the beginning of 2021, Missouri will be led by a governor with extensive tenure in local and state government. Greitens announced Tuesday that he was stepping down, a move that followed more than five months of shocking revelations and criminal charges that tarnished the former Navy SEAL’s tenure in office. The potential of Parson to take on Missouri’s top job became more pronounced in January after Greitens acknowledged that he had had an extramarital affair. Calls for Greitens’ resignation became louder after he was charged with two felonies — and once a House report came out where the woman with whom he had the affair alleged sexual and physical abuse. With Greitens departure, Missouri now has a very different person in the governor’s office. Unlike Greitens, Parson has extensive elected experience. Before being elected lieutenant governor in 2016, Parson served as a state senator, state representative and Polk County sheriff. He often played a substantial role in handling complex pieces of legislation — and getting involved in controversial issues. Attorney General Josh Hawley briefed his fellow Republican a few hours before Parson took office. "I think the incoming governor is prepared. I was extremely impressed with the work that he has done in 48 hours. He is ready to take office," Hawley said. He added in a written statement, "Mike is a true public servant. He has served our country in uniform and our state in public life. A family farmer, Mike has never forgotten his roots and comes with a dedication to doing right by all Missourians." In a brief session with reporters a few hours before he was sworn in, Parson said he called Greitens by phone, but was only able to leave a message. "But you know what, there's been a lot of good people across the state of Missouri, from both sides of the aisle that have reached out to say hey, whatever I can do to help, I will. And that's past governors, past chief of staffs," he said. "And I truly appreciate that, we do, because it is a daunting task in two or three days to prepare to be the governor of the state of Missouri." Parson already has a very full plate. 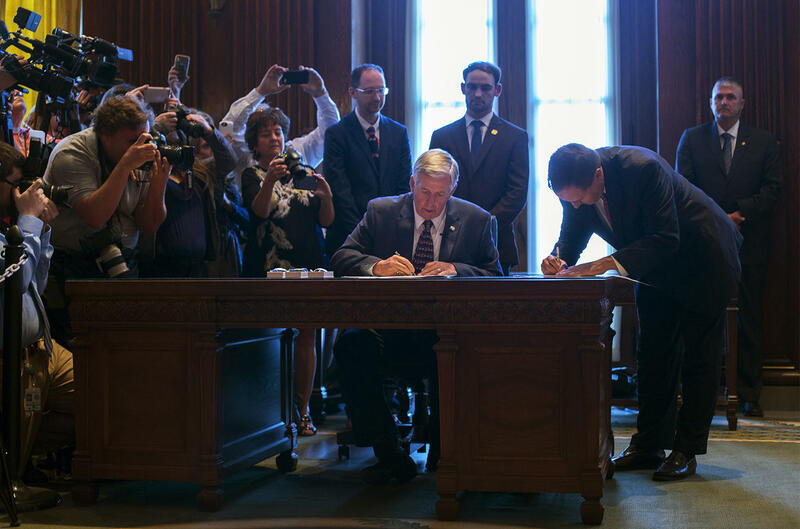 Though Greitens signed more than 75 pieces of legislation on his last day on office, many major bills remain, including the ones that make up the state budget. "We may want to go back and take a look at some of that," Parson said. "When you get into omnibus bills and large pieces of legislation, you've really got to vet it to make sure it's right." Parson also pledged to act quickly to fill seats on the Missouri State Board of Education, which has been unable to meet for months because it lacks a quorum. As lieutenant governor, Parson highlighted problems at a St. Louis veterans home. He’s also broken with Greitens on some key issues, most notably a decision to freeze low-income housing tax credits. And he’s also said that statewide leaders not only need to support raising taxes for transportation infrastructure, but added that they should be actively campaigning for such a move. Many Republicans are expecting Parson’s legislative experience to be helpful to fulfill legislative priorities that fell by the wayside during Greitens’ tenure. Despite coming into office with more GOP legislators than any other Republican governor in history, Greitens often bickered with lawmakers whose support he needed in order to pass an agenda. “Mike has always been someone interested in results, no matter who gets the credit and I know he will work well with House and Senate leadership and legislators in both parties to get things done for Missourians,” said former Gov. Matt Blunt in a statement this week. U.S. Rep. Ann Wagner, R-Ballwin, said she was grateful for Parson's willingness to serve. "For years, I have worked with Gov. Parson to serve the people's interest," she said. "His integrity and extensive experience in law enforcement, public service and on his family's farm have equipped him to provide the thoughtful leadership our state needs." Former U.S. Sen. Kit Bond, called Parson a well-respected and qualified leader "who will bring a spirit of openness and collaboration to the office." And former Missouri Gov. John Ashcroft called it a "time to reach forward. Missouri needs to take its place as a leader in the American recovery. With our prayers and help, Gov. Parson can be the real leader we need for these times." It’s not just Republicans who are bullish about Parson’s potential. Some Democrats like state Sen. Jamilah Nasheed believe Parson will take her party’s concerns to heart, citing his willingness to consider giving local control to the St. Louis police department earlier in the decade. Kansas City Mayor Sly James, also a Democrat, will meet with Parson on Tuesday as a member of the biparsitan group Missouri Mayors United for Progress. "This will be a good start towards building a productive working relationship going forward," James said. Issue stances aren’t the only difference between Parson and Greitens. While Greitens grew up in suburban St. Louis County and lived for years in St. Louis, Parson spent most of his life in small southwest Missouri towns. Born in Wheatland, Parson grew up on a farm. He recalled in 2016 that he and his brother used to collect soda bottles on the side of the road to sell for a bit of money. Parson eventually joined the Army when he was 19. He was sent to Germany, and served in the military police corps — a job he says started his long professional association with law enforcement. He eventually worked his way into the criminal investigation division of the Army. But Parson said a major part of his professional life began when he was 15, a time when he started working at gas stations. He eventually bought two of them, and ran them while working at the Polk County Sheriff’s Department and raising cattle on his farm in Bolivar. The Missouri Farm Bureau congratulated Parson in a statement, calling him an outstanding leader for the state. "Agriculture is the leading industry in Missouri, and we’ve never had a governor with deeper farming roots or broader agricultural experience. Hundreds of members of the Missouri Farm Bureau consider Mike Parson a personal friend, and every Missouri farmer considers him a friend of Missouri agriculture," the bureau's president, Blake Hurst, said. U.S. Rep. Jason Smith, R-Salem, also praised Parson's rural roots and his help in passing "Right to Farm" legislation in the state. "Mike gets it," Smith said. "I look forward to working with him to bring jobs to Missouri, help our economy grow and make sure the Missouri family and farmer always comes first." Parson said he plans to be on the farm as often as possible as governor. "We're going to maintain as close to a normal life as we can as far as back home, even with this obligation," he said. Parson was elected Polk County Sheriff in 1993, a job he held until 2005. He then ran for and won a House seat that serves a portion of southwest Missouri. While serving in the Missouri House, he eventually became the chairman of the powerful Rules Committee. He played a role in killing a constitutional amendment that, if approved by voters, would repeal protections for stem cell research in Missouri. In 2010, Parson won election to a Senate seat that took in a number of counties in south central Missouri. He lead the charge in 2011 to make changes to a ballot initiative regulating dog breeding, which then-Gov. Jay Nixon signed into law. He also was instrumental in passing a bond issue for colleges and universities. And he was a vocal supporter of the “right-to-farm” amendment, which was aimed at barring regulations toward agriculture. “If we both mutually benefit about something making it through the system, we’re both going to support it,” Shively said. 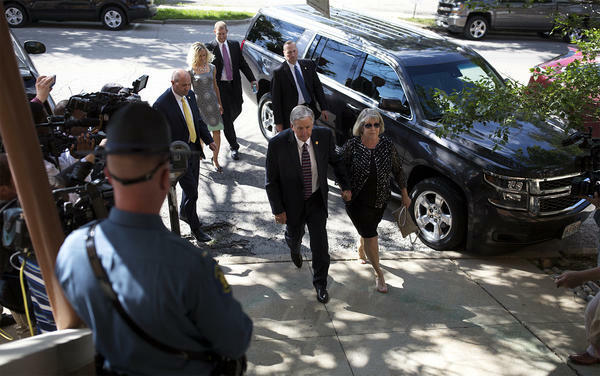 It could be argued that tragedy propelled Parson into statewide office. After state Auditor Tom Schweich committed suicide in 2015, Parson gave a passionate speech on the Senate floor decrying a radio ad that made light of the GOP statewide officeholder’s appearance. He said in 2016 that Schweich’s death should have prompted Missouri politicians to reconsider their tactics and the amount of money needed to win an election. Parson initially announced he was running for governor. But he changed course to seek the lieutenant governorship. Among other things, he cited then-Lt. Gov. Peter Kinder’s entry into the race — and his assessment that his message about “positive politics” would get lost in a crowded GOP gubernatorial contest. Ultimately, Parson won a hard-fought primary against Kansas City attorney Bev Randles and a decisive general election contest against former Democratic Congressman Russ Carnahan. Unlike Parson, Carnahan had substantial statewide name recognition — as his father and sister both served in statewide office. Nevertheless, Parson won thanks to huge margins in rural Missouri. Still, even though Parson hails from outstate Missouri, he’s often cited a desire to bridge any divide between rural and urban parts of the state. He pointed to his efforts to set up an economic development hub in Israel, which he said resulted in startup companies setting up shop in Missouri. Parson isn’t without his detractors. He faced criticism during the 2016 campaign for taking free meals, entertainment and travel from lobbyists. And some senators balked at voting for him in 2012 for Senate majority leader because of his close ties to Steve Tilley, a former House speaker who became a powerful lobbyist. Missouri Democratic Party Chairman Stephen Webber points to that episode as a counterpoint to the belief that Parson will unite the GOP divided over Greitens’ demise. “When I think of policy outcomes, I’m concerned about what’s happening to the state. I’m concerned with what’s happening to people,” said Webber, who served with Parson in the Missouri House. “And the Republican establishment has been attacking working Missourians consistently. So whether that’s Eric Greitens or Mike Parson, they’re going to continue their attack on workers’ wages. They’re going to continue their attack on education. One key difference of opinion is on low-income housing tax credits. Parson was one of two people to vote against Greitens’ freeze of the program, contending that it was short-sighted and could hurt the ability to cultivate quality housing for vulnerable people. As governor, Parson could appoint people to the Missouri Housing Development Commission to reverse that decision. But that could be complicated by two different events: The first was the House Budget Committee’s decision to deauthorize the low-income housing program. The other is allegations that the revelation of Greitens’ affair was retaliation for the tax credit embargo. Roughly $120,000 was delivered to the attorney of the ex-husband who exposed the governor’s affair by Scott Faughn, a newspaper publisher with ties to low-income housing developers. Parson has said he had no knowledge of who's behind Faughn’s cash transaction. While the person who gave Faughn the money is still unknown, lawmakers say they will continue to pursue the identity of the funder. And the controversy could cast a shadow on efforts to restart the program. State Rep. Michael Butler, D-St. Louis, said that controversy shouldn’t have any bearing on what Parson decides to do.